Where to see the vestiges of nuclear weapons tests around the world. The atomic age began on July 16, 1945, when the Manhattan Project detonated its first successful nuclear weapon test in the New Mexico desert. Less than a month later, atomic bombs were dropped on Hiroshima and Nagasaki. From then up until the signing of the Comprehensive Nuclear Test Ban Treaty in 1996, over 2,000 nuclear test explosions have detonated on remote islands, atolls and stretches of desert around the world—the vast majority in the United States and Soviet Union—to prepare for the possibility of nuclear war. Although, mercifully, the Cold War never turned hot, remnants of this charged chapter of history can still be found today throughout the U.S. and former Soviet Union. Below are seven nuclear test sites in the Atlas that you can still visit today, vestiges of this sobering turning point in the evolution of warfare. On July 16, 1945, deep in the deserts of New Mexico, the Atomic Age was born. “Trinity” was code for the first detonation of “The Gadget”, a nuclear device conceptually similar to its devastating cousin, “Fat Man,” the latter of which was infamously detonated over Nagasaki three weeks later. While the U.S. military may not have had to foresight to grasp the horrific long-term destruction of a 13-pound plutonium device, they knew what it could do on initial contact, because Trinity gave them a good show. The 600-foot-wide fireball obliterated trees, turned sand into glass, and blew out windows 120 miles away. Normally off limits to civilians, the desolate scene of Trinity’s detonation is open to the public on the first Saturday of April every year. 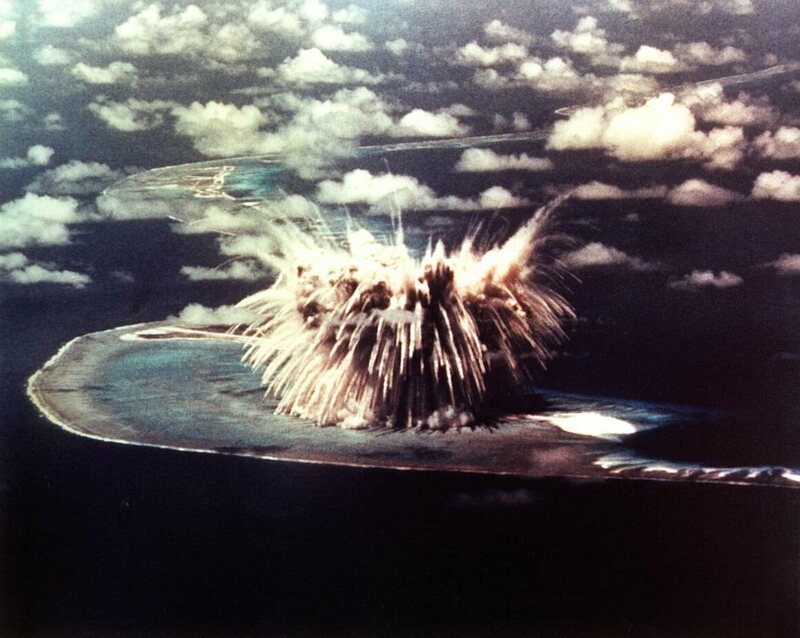 Islands and atolls in the South Pacific were used in over a hundred atmospheric nuclear tests by the U.S. military during the Cold War era. In the late 1970s, in an effort to clean up the radioactive debris left by those explosions, the government dug up 111,000 cubic yards of soil and deposited it in a 350-foot-wide crater on Runit Island that was created by a nuclear test code-named “Cactus.” Three years a a quarter billion dollars later, a an enormous, foot-and-a-half-thick, 100,000-square-foot concrete dome was built over the nuclear crater. Despite signs warning off visitors, it is still possible to make landfall on Runit and stomp across the Cactus Dome. The Polygon in the former Soviet closed city Semipalatinsk (known today as Semey) was the primary nuclear test site of the Soviet Union. In total, 456 nuclear tests were conducted here between 1949 and 1989, including 340 underground and 116 atmospheric explosions. Altogether, the number of nuclear explosions at Semipalatinsk equals more than 2,500 Hiroshima bombs. A huge number of craters, partly filled with water, testify to these experiments. Located relatively close to a major settlements, this is also the site of one of the most horrible legacies of the Cold War era: where the Soviet Union tested nuclear bombs on civilians. The military conducted these nuclear tests without regard to the health effects on the 200,000 residents of the Semipalatinsk area, who weren’t evacuated or warned during the actual explosions. Residents noticed health terrible problems soon after the first tests, and though the site was finally closed in 1989, the legacy of the nuclear tests lingers on. An area of more than 18,000 square kilometers is heavily contaminated and over a million people have been diagnosed with health problems. Nevertheless, even today people continue to live in the Polygon area. At first glance, the barren landscape of Novaya Zemlya (Russian for “New Land”) might not seem like the sort of place where anything interesting has ever happened. But its remote location and small population meant that it was designated as a nuclear test site in 1954, and over the next 35 years was the location of 224 nuclear detonations—including the world’s largest nuclear explosion, Tsar Bomba, dropped by the Soviet Union in 1961 over Novaya Zemlya Island. Most of the island still remains a military base to this day, although cruise ships often frequent the southern part of the archipelago. In 1955 a series of 14 nuclear test explosions known as “Operation Teacup” were set off in the Nevada desert at Yucca Flat. The most memorable part of the tests were the purpose-built homes and other structures set at varying distances from the blasts to test the impact and effects of the explosions, known collectively as Survival Town (or less optimistically, “Doom Town”). The most disturbing element of the fake town was its citizens: The homes were populated by 1950s picture-perfect mannequin families, bravely facing their imminent doom going about their daily routines in dapper outfits as thousands of spectators watched the atomic test bombs destroy the model town. Located about halfway between Hawaii and Australia, this Micronesian Island chain should be a heavenly place on Earth. Unfortunately that is not at all the case. Its residents were forcibly relocated when the U.S. took possession of the islands in 1946, and over the next 12 years sent 23 nuclear bombs raining down on this slice of paradise, rendering it uninhabitable to this day. During the first practical test of a hydrogen bomb at Bikini, 23 members of a Japanese fishing boat crew that were supposedly at a safe distance were contaminated by the blast, and the scandal that rocked the nation was epic. It eventually became the inspiration for the movie Godzilla, in which a radioactive monster rises from a U.S. nuclear test and attacks Japan. 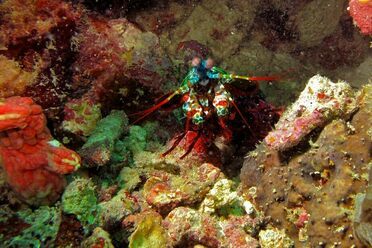 To this day, the islands sadly remain a paradise of staggering beauty and potential that no one can safely experience. In 1962, a 1,527-foot tall guyed mast was built at Yucca Flat, with an unusual task: It carried on its upper section an unshielded reactor mounted on a sledge. The height of the mast is approximately the same as the height at which the bomb dropped on Hiroshima exploded. The mast was designed to simulate the radiation of that bomb. Built using 51 30-foot sections of high tensile steel, the mast is taller than the Empire State Building. Despite its immense size, the BREN (Bare Reactor Experiment, Nevada) Tower was dismantled and rebuilt in Area 25 of the Nevada Test Site, where it was later used for a series of radiation measurements. This was following the Nuclear Test Ban Treaty, which put an end to open-air nuclear testing. What's Left of America's Cold War Civil Defense System? Hawaii is testing its nuclear warning signal. How much other infrastructure is still ready for action?